The City of Fort Wayne’s Community Development Division has hired Susan B. Eisenhauer as the new Neighborhood Code Compliance Director. Eisenhauer replaces Cindy Joyner, who is now the Division Director of Community Development. August 30, 2018 - Great Lakes Capital and Bradley Company, along with Fort Wayne Mayor Tom Henry, have officially cut the ribbon to open Skyline Tower, a $42 million mixed-used development in the heart of downtown. Located at 855 Webster St., Skyline Tower rises 12 floors above its downtown neighborhood and features 123 distinctive apartments, as well as 30,000 square feet of commercial space. The first floor is home to Ruth’s Chris Steakhouse, while the second floor is the regional headquarters of First Merchants Bank. Fort Wayne Mayor Tom Henry today announced the members of the newly created Fort Wayne Public Art Commission. Members of the Commission will be sworn in at 9 a.m. on August 30 in Community Development Room 324, on the third floor of Citizens Square. Following the swearing-in ceremony, the Commission will hold its first meeting. The City Redevelopment Commission is investing in infrastructure to support business growth in northwest Fort Wayne. Two businesses are constructing new buildings in Summit Park II and expanding their operations, while Alconex is building a new facility nearby along Ludwig Road. 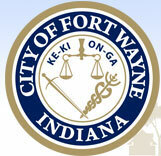 Fort Wayne Mayor Tom Henry today announced that 10 local non-profits will receive funding from the City’s federal Community Development Block Grant (CDBG) dollars. Approximately $180,000 will be available to help low- and moderate-income residents with shelter, basic needs, employment skills, language translation and interpretation, and youth development. The Mayor made the announcement at the Renaissance Pointe YMCA, which offers the Students of Success College and Career Readiness Program that will be supported by CDBG dollars.